Dude, these tax-revenue figures are really harshing my mellow. It's been just three months since marijuana was legalized in Colorado, but economists don't think the state will raise as much in taxes as was hoped. They had expected to raise $22.7 million before July from special sales taxes on recreational marijuana, but state economist Larson Silbaugh is skeptical. About $3.4 million was raised in January and February, the only months for which sales have been reported so far. "If current tax revenues keep coming in at the same pace, we won't meet that expectation," Silbaugh said. Economists have also lowered the forecast for the full fiscal year ending in June 2015 to $54.7 million from $67 million. The forecast was cut because fewer people switched from buying medical marijuana to buying recreational marijuana than was first expected, Silbaugh said. Medical marijuana users need to get approval from a doctor to buy the drug, but the state taxes those sales at just 2.9%. Recreational marijuana is taxed another 25%. Still, making predictions for such a new industry is tough. 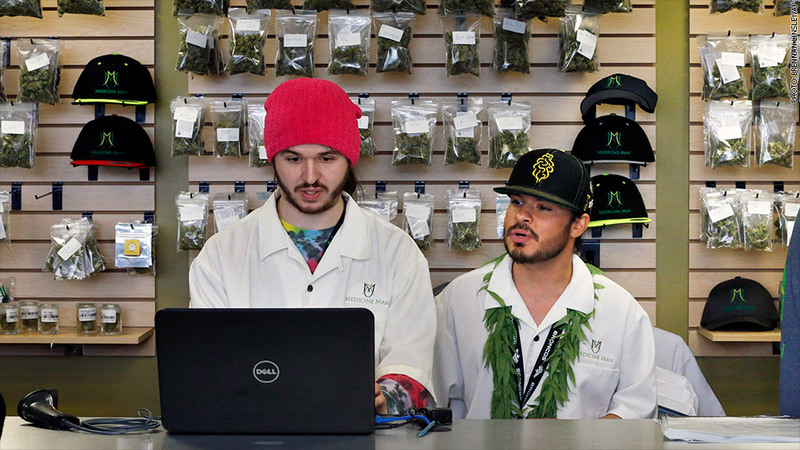 Colorado is the first state to legalize sales of recreational marijuana in the country. Early numbers may not accurately reflect what will happen when the marijuana market is completely developed. Sales in the first couple of months could be inflated due to the initial hype. But on the other hand, sales could be getting off to a slow start because only 24 retail stores were open for the entire month of January. Now, that number has more than doubled. Gov. John Hickenlooper's office has its own predictions, which put tax revenue at about $98 million for the first fiscal year. But the governor also recently lowered his forecast, too, by about $20 million. The tax revenue is slated for school construction, substance abuse treatment and programs aimed at keeping kids away from pot.